ecommerce shopping cart. This video tells you why. Want to make BIG affiliate money? Don’t like to read long webpages? Don’t laugh! This one-of-a-kind speaking system will teach you exactly how to double, triple, or even quadruple your income from speaking . . . AND you can do it in record time! Learn all the tips and tricks the high-income pros use to create and market fantastic presentations. I used to make $75.00 per presentation and kill myself doing 4 or 5 a day just to barely make a living. NOW, by using the techniques in this system, I make $17,500.00 per speech / $20,500.00 per day, and travel the world accepting only the best gigs. Just think what it would mean to you and your family if you grabbed that same kind of success. 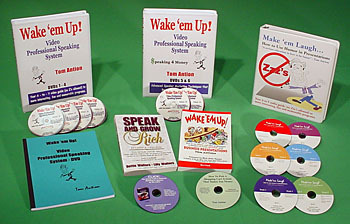 You can do it and The Wake ’em Up Professional Speaking System will lead the way! This video teaches you how to get the most out of your presentations. What kinds of WordPress plugins work best? Learning the latest blog techniques can help you find a job. The Internet Marketing Training Center of Virginia is an Internet marketing school designed to teach you everything you would need to know about selling your products online. No only can you sell your products and services, you can also get hired by companies looking for the same thing. Check out http://www.imtcva.org for more information. You know that public speaking book you have always wanted to write but never did because you would have to pay the printer to print hundreds more than you need and then store them forever in your garage? I have good news for you. Now with print-on-demand, you can have a few or many books printed at a nominal price. This means you can order just enough to sell from your website, at your book signing, at back-of-the-room sales during your seminars, or for giving away to promote your business. Each book is printed when you or your client orders it and you only pay for the quantity ordered, whether it is one or 1,000. At Antion & Associates, we’re using createspace.com for print-on-demand. It’s a free online self-publishing tool that helps you prepare your book for printing. * Enter information about your book into the createspace software. * Upload a.pdf file of the content. * Upload a.pdf file of the cover. After you upload the .pdf files, you can order a proof copy for a few dollars and createspace will print it and mail it to you. As soon as you approve the proof copy, createspace will make it available for purchase and even distribute it through Amazon.com and other outlets. When you or a customer orders, createspace will print as few or as many copies as you want. The price of the book covers the production costs and your royalty. It’s a win-win because you have no setup fees and no inventory to store. In addition, Amazon offers a lot of tips to help you self-publish your book through createspace.com. Well known DC dating coach needs someone super savvy with social media, youtube, blogging, websites, writing articles, link building etc. to help promote several web sites. Must be reliable. Some work can be done from home. Job will pay generally about $8.00 an hour, but frequently you will get project work that if you finish it fast will up your hourly rate. If you don’t have all the skills mentioned above, apply anyway. We may hire more than one person and we’ll train people we like. Must have your own computer and Internet connection. There are thousands of career options available to you. The Internet is providing fun and exciting careers that you can learn from home! Learn how you can discover the hottest and most in demand jobs available today. At the Internet Marketing Training Center of Virginia, you can get a dedicated certificate in as little as six months and be on your way to a great job. Visit the site to download your free career guide. No, you don’t have to go on-stage in a gorilla suit, although you could if you wanted to. A costume can be anything from a flashy tie, to a feathered hat, to a full blown shiny Marca Polina outfit (the feminine Marco Polo) complete with an illuminated magic wand, that my friend Sally Walton wears when she talks about the magic art of “Communicating Across Cultures.” Costumes add a flare and excitement to your presentations and certainly help to make them more memorable. If you don’t like to wear costumes, get the audience members to wear them. Better yet, get the “big shots” to wear them and you will probably be the hit of the meeting. I was doing a customer service talk for a pizza franchise and I had one of the senior managers march into the meeting wearing a filthy, doctor’s lab coat with ketchup all over it (fake blood). I had another senior manager come in with a crisp, new lab coat. I asked a simple question, Which manager would you like operating on you? Of course, all the junior managers yelled out that they wouldn’t let either one of these people operate on them. Everyone was laughing and joking around, but the point was made. They must keep their employees looking clean and neat because nice customers won’t want to be served by grungy food service workers. Costume characters can be hired to hand out fliers at your event, entertain, and generally create an air of fun and excitement. The local heart association has a “blood drop” costume they use when they are soliciting funds. There are literally hundreds of costumes available through costume shops or via mail order. Just make sure, as always, the theme of the costume matches the theme of your presentation or event. Learn how to market online. Work for a company or for yourself. The Internet Marketing Training Center of Virginia will help you get certified in Internet marketing. In as little as six months you could be making money online. Facebook has begun testing a slew of changes to the News Feed, including friend list filters and Smart Lists that automatically categorize your friends. The changes seem to be aimed at making the content within the News Feed more relevant. These changes, show that Facebook is dividing the News Feed into lists, much like Google+ has done with Circles. “Feed filters make it easy to see a selected set of friend’s updates in one place and share exclusive with them,” Facebook’s guide to the new feature states. One of the most interesting aspects of the revamped News Feed is the addition of Smart Lists. Smart Lists automatically sort your friends into a work list, a list for classmates and a list for friends who live within 50 miles of your city. This makes it easy to post updates just to your college friends or to talk about a local party with just your nearby friends. The changes are likely to be construed as a response to the rise of Google+, whose Circles feature makes it easy to share content with smaller groups. Facebook has always had Friend Lists as a feature, but less than 5% of users use them in any meaningful way. These changes are designed to fix that. Visit Tom’s Fan Page for tons of free training!